The critically acclaimed and best-selling Collins Bird Guide has been lauded as the essential field guide for Europe, North Africa and much of the Middle East since its initial publication back in 1999. An eagerly awaited, revised and enlarged second edition, adopting many contemporary taxonomic and status changes, cemented its reputation as a birding tome in 2010, and it remains as popular as ever, omnipresent on birders’ bookshelves across Europe. There is an ever-expanding market for apps and eBooks as more and more of us acquire smartphones and tablets in this technological age. Birding is no exception — many birders have long ago cottoned on to the fact that a smartphone is the perfect in-the-field companion, and there is already a great range of birding apps on the market, for staying up to date with rare bird news, keeping and submitting your own records, and much more besides. Despite the existence of a couple of excellent field guide apps for North America, there has been a gaping hole in the market. Europe, home to arguably the world’s most dedicated and established birding nations, lacked a comprehensive, high-quality field guide in app form. Back in early July we were teased with this short trailer from revered app production company Touch Press, hinting that the wait for a title meeting such demanding criteria might soon be over. Now, in August 2014, cometh the hour for the release and introduction of the Collins Bird Guide app. To the first-time user, the app is instantly identifiable – on loading, the introductory screen consists of the customary gold and white text on black background, the centrepiece being an illustration of a flying Arctic Tern (as found on the cover of the second edition). The home screen is fresh, simple and beautifully laid out, the colour scheme a tasteful concoction of black, white, greys and muted gold which has evidently been inspired by the book's iconic cover. The layout of the content, however, is distinctive. Touch Press has built a strong reputation for producing high-quality, intuitive apps in recent years and the company's work to convert the Collins Bird Guide to interactive form is no exception. Leaving behind the classic field guide layout (text on one side of a two-page spread and illustrations on the other), the app takes on a three-tier structure. The crucial thing here is that each tier is presented as a single, scrollable vertical list in taxonomic order (there is also the option to order species alphabetically), and alternating between tiers is effortless thanks to the menu bar at the bottom of the screen. This interactivity ensures that it’s easily navigable – in other words, it’s a very straightforward system to use despite being, even when tentatively exploring for the first time, conceptually new. The first of the tiers doubles up as the app’s home screen, offering the entirety of the guide’s contents: the introduction as well as all of Europe’s bird families, clearly set out in taxonomic order, defined by mini illustrations and presented as a scrollable montage. The only exception is that all North American passerines are grouped together in a single ‘pseudo-family’ – for me, a sensible decision. Click on any family, and you're taken to the second tier (family level) which is again presented as a montage, this time with the species within the chosen family represented by names and illustrations. Click on any species to access the third tier (species level). Here you’ll find familiar content from the Collins Bird Guide, including the fully annotated illustrations by Killian Mullarney and Dan Zetterström, as well as range maps and Lars Svensson’s species accounts. The accounts, distinguished by a pale grey background, are expandable/collapsible by a single tap. Attention to detail is clear; for example, you can pinch the illustrations to enlarge, and tap on them to add or remove annotations. One feature that gives the app an advantage over the book is that the majority of species are accompanied by one or more sound recordings from a total of more than 750, many of them captured by Svensson himself. Different species are treated accordingly; for example, warblers have both songs and calls, while less vocal species (such as herons) are generally accompanied by a single recording. Furthermore, 60 regularly seen species (examples include Mute Swan and Oystercatcher) are illustrated by annotated high-quality video footage in the basic version of the app. Further footage will be available for download in the form of two separate optional video library bolt-ons: Volume 1 (£3.99) will cover common birds of north-west Europe (including 185 species), and Volume 2 (£5.99) represents a further 300 less common and local species. Another thoughtful feature is the inclusion of the distribution maps from the British Trust for Ornithology's (BTO) Bird Atlas 2007-11, with maps for 271 species available as an additional pack for £1.99, a percentage of this revenue going to the BTO. This allows for a more intricate and up-to-date understanding of the range and status of bird species around Britain, and is ultimately much more relevant in a local context for British birders than the Europe-wide standard range maps. The impressively innovative ‘similar species’ function is the feature that really sets this apart from other field guide apps. A lot of effort has evidently been invested in determining the relevant criteria for each species, and it certainly appears to have paid off. Appearing in the species accounts, a single tap on the relevant icon will instantly bring up one or more similar species (if there are any), while one can even choose between the differing plumage of certain birds to view confusion species. 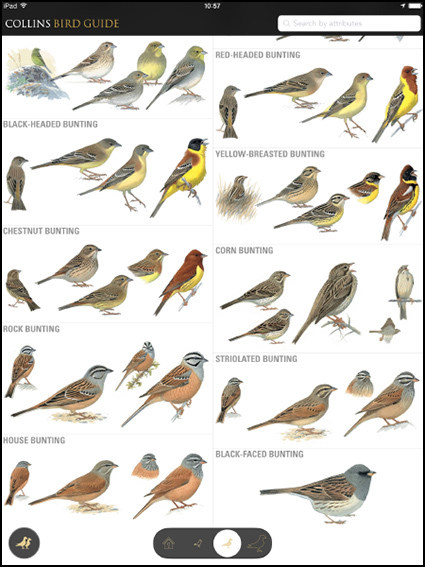 Black-headed Bunting, for example, gives the opportunity to compare gaudy yellow males and the much subtler female and immature plumages against their respective potential pitfalls. Alternatively, at the home screen, this feature sits as its own function where the user is able compare any species via up to six criteria including range, season and habitat, as well as phenotypical attributes such as plumage, size, shape and so on. Cleverly, the app uses GPS to determine your position and therefore the relevant region. This will no doubt be an extremely useful feature for birders holidaying in locations where they may not necessarily be familiar with identification possibilities. I could find next to nothing that I didn’t like about the app; the main issue I discovered was that the species comparisons are evidently optimised for viewing on the larger screen of an iPad. 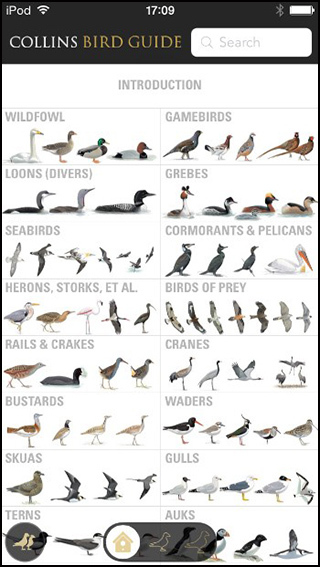 On my iPhone 5s, the presented information appears very small for some species comparisons (Arctic, Common and Whiskered Terns for example), with the text unreadable when they are presented directly together in this way – something that would be curable with the introduction of pinching in a future version. Another minor (and slightly pedantic) point is that there are the odd snippets of out-of-date information in the text, and some of the British status codes are a little wayward – though these are problems stemming from the original text, rather than a fault of the app itself. Given the resounding success of the Collins Bird Guide over the past 15 years and its undisputed position as the region's top field guide, the potential for a quality app version was always great. However, putting theory into practice is no mean feat and the Touch Press team is to be applauded for forging an avant-garde production that is crisply designed and extremely well presented, and also boasts a number of thoughtful, innovative and above all instructive features that the book version could never offer. And, to boot, it weighs nothing – a sure-fire bonus when out on an exhausting day in the field! The basic edition (without aforementioned add-ons) costs £12.99 – a very affordable and competitive price which, once you've had chance to take the time to use the app, you'll no doubt agree represents extremely good value for money. I can only envisage that the Collins Bird Guide app is destined to become a real triumph, the ultimate in field guide apps – and deservedly so. This review first appeared on BirdGuides. Click on the image below to view the teaser trailer.